Hello from the US of A! Happy summer! Over here it's extremely hot and sunny. I'm soaking up all the vitamin D I can to carry me through the Swedish winter. My mom's garden is laden with the freshest of fruits and vegetables. There are pear and fig trees, an abundance of raspberries, green tomatoes, zucchini and its flowers, nasturtiums, swiss chard, basil, mint, thyme, parsley... the list goes on! The first meal I wanted to make in America had to incorporate things from the garden as well as tempeh because it's so nutritious and easy to find here! Traditionally from Indonesia, tempeh is a fermented legume cake usually made with soybeans. It tastes a bit like mushrooms/cheese and has a meaty texture and is therefore a perfect protein component to your meal! The soybeans are soaked overnight, hulled (skinned), crushed, boiled, sprinkled with the starter rhizopus oligosporus and then fermented for 24-30 hours in a warm incubator. I know a little about making it because last year I was fortunate enough to take a tempeh-making workshop with my tempeh mentor Barry -- Barry's company Grown in Brooklyn makes and sells fresh tempeh throughout NYC so you guys that live here are so lucky because he sells all kinds of tempeh, from traditional to soy-free! 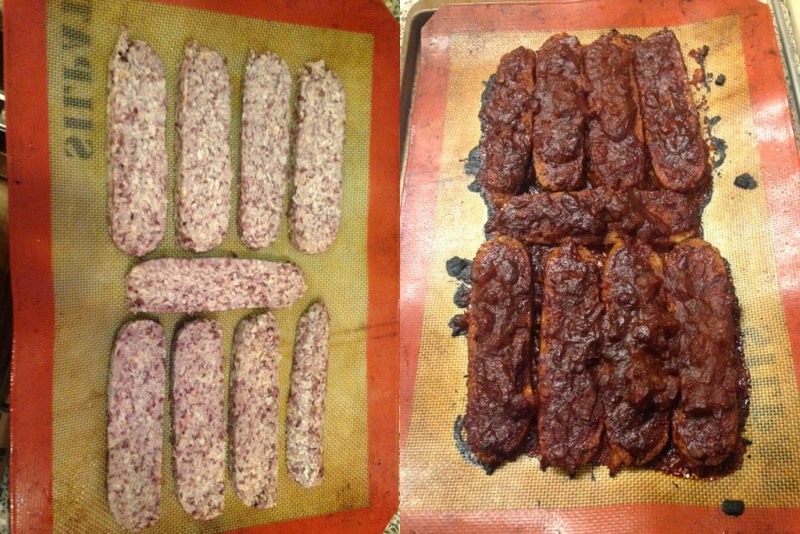 Since I live in Sweden where tempeh is not so easy to find, I thought it would be a great skill to learn. With Barry's guidance and help from my husband building me an incubator, I've been able to successfully ferment tempeh. However, as I'm experimenting with a lot with alternative legumes and techniques, I still haven't perfected this craft. I'll get there one day soon, hopefully. Tempeh is more nutritious than most soy products (like tofu) because it's still a whole food and minimally processed. The texture is meaty, which makes it enjoyable as a meat substitute. But mainly, it's really high in protein and iron, among other things. Since the beans are soaked AND fermented, the nutrients are more readily available and absorbable in the body and also more digestible = easier on your stomach!! It's also got friendly gut bacteria -- probiotics and is usually gluten-free! So have I tempted you to try tempeh? And if you're worried about eating too much soy, well, it's becoming easier to find soy-free tempeh! The one I've used is adzuki bean and brown rice tempeh but they also sell white bean tempeh as well as quinoa and buckwheat tempeh. Many people lightly steam tempeh before eating or preparing, but freshly-made tempeh like Barry's Tempeh can be eaten directly from the package. I love to make tempeh bacon, tempeh tacos, tempeh burger, but we keep coming back to barbecue tempeh because it's simply a crowd pleaser! So don't forget to have this at your next Super Bowl or bbq party, everyone will be licking their fingers! 1. Make the sauce: In a heavy-bottom pan, heat oil and sauté the onion until soft, then add garlic, paprika, tomato paste and stir. Then add the molasses, tamarind, liquid smoke, chipotle, salt, pepper and water. Simmer for about 10 - 15 minutes until thickened. Taste for seasoning. 2. Preheat the oven to 220C or 450F. Prepare the pan: melt coconut-oil and grease the parchment paper and place on a cookie sheet. Slice the tempeh about 1/2 inch thick slabs and place in the pan, leaving a half-inch gap between them. Carefully place a thick layer (about 1/2 inch) of sauce on each slab and then turn and place more sauce on the other side. Repeat with all the slabs. Bake for 10 - 20 minutes until the water from the sauce has evaporated and the tempeh begins to charr slightly. Serve warm with a fresh salad. Yum! Thanks for sharing. I always wanted to try and make tempeh. Thank you so much LeeLee for your feedback, I do hope you try it, it's so versatile and delicious! !